This may seem like a random post since I'm largely a mac user but I recently upgraded the ram in my sisters Acer 5000z laptop and figured I'd throw up some pictures on the blog for those who may be intimidated by doing an upgrade like this. If you find your computer slowing down a ram upgrade can be the simplest and cheapest way to give it some new life. Ram upgrades are generally the easiest upgrade you'll do to a computer but for those with a faint heart it doesn't hurt to have a tutorial. Please keep in mind that I am not a professional computer technician and this blog is only for advising purposes. Please do your own research and do this upgrade at your own peril! 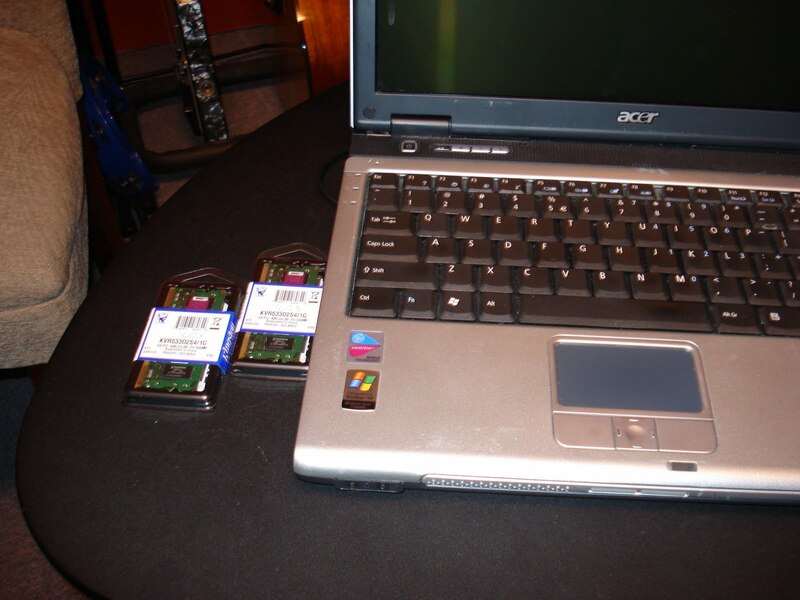 Here's a pic of the laptop with the ram chips beside it. Pretty huh? ***IMPORTANT*** Turn the computer off unplug the laptop and take the battery out as well to make sure you and your computer are safe. Once the lid is open you'll see a ram chip or two. There's clips on either side that you can gently click away from the ram. After you've done that the ram will pop up a bit and you can slide it out. There's two spots for ram chips. Just do the reverse of what you did to get them out. Pop the chip in, push it down and clip it in. Once that's done put the cover back on and you're good to go.